A rogue pheasant is believed to be behind a series of attacks on unsuspecting walkers in Wiltshire. Residents of Bishopstone, near Salisbury, have reported six assaults by the fowl over the past six months. 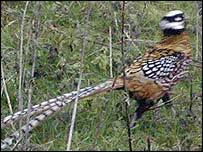 The bird is thought to be a Reeves Pheasant, a rare Chinese variety that was probably hatched in captivity. Farmer Edward Draper said he had spoken to fellow villagers who had come across the bird, and heard stories of attacks first hand. "Normally they are very placid birds, this one seems to come from some distance away and attack people and peck at you," he said. Mr Draper, an independent member of Salisbury District Council for the Chalke Valley ward, added: "It only seems to be in this village, I've heard of nobody else in my ward who has had this problem with pheasants." Reeves Pheasants' feathers, which can be up to 6ft long, are occasionally collected after they fall out and used for costumes in Chinese Opera. Simon Mayes, of the World Pheasant Association, said: "This is an endangered species, its natural country of origin is China and this particular bird probably escaped from a private collection or zoo."